Skateboarding and surfing are a new way of life for the local children of Mahabalipuram who are taking the Internet by storm. Chances are, if you like to travel you’ve heard of or been to Mahabalipuram. What people don’t know about the town, though, is that the local children here spend all their free time riding waves and doing flips on skateboards! When you step on the beach you can see the sea dotted with children who are just beginning to learn how to surf, as well as those who have mastered the waves. Walk a little further into the village and you will find another unique sight— a tiny skating ramp on which the local kids try to pull stunts! 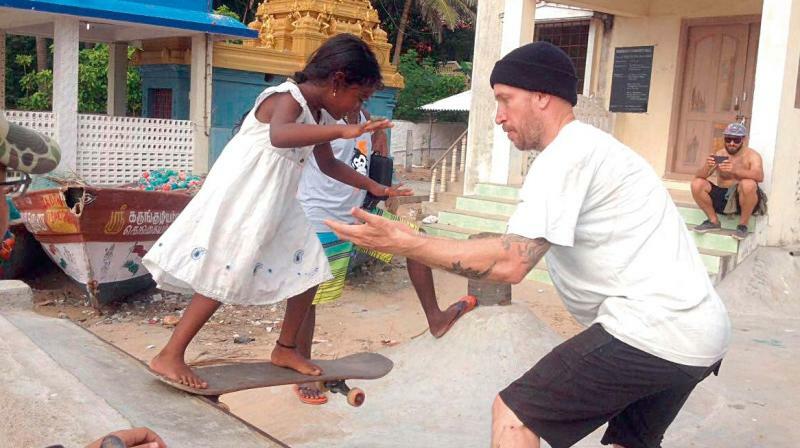 It all began when Kamali Moorthy, a 6-year-old young girl from the quaint village, whose parents are fisherfolk in the community, shot to international fame when a picture of her skateboarding was shared by legendary skateboarder Tony Hawk on social media. Kamali became the toast of the sport’s forums online, as the picture went viral, prompting another popular exponent in the field, Jamie Thomas to visit the little village on the outskirts of Chennai. What he found there was remarkable — an entire village and community of fishermen and women, who have prompted their little kids to take to surfing and skateboarding, before and after school — to ensure that the sporting activities give them new-found purpose in life. Kamali also peppers the conversation with a couple of “I love skateboarding, it’s a lot of fun,” before heading back to the ramp. When the raging sun grows calmer, the sea becomes more and more crowded. Kamali heads down with her uncle Santosh, who is a surfing ace, to learn how to tackle the ocean. In the shallow end, you can see the young ones learning how to catch the smaller waves while farther down you can see older kids getting the grip of conquering the waves. Surfing, bodyboarding, and skinboarding — they do it all. And they start as young as five years of age!